"I work with garbage - because there is just too much of it." Little plastic drinking straws stuck to drink pouches are used for an average of 4 seconds and take decades to crumble. The unseen molecules are here to stay. We need to understand our world has reached a tipping point. We need to make a pivotal change in how we consider and manage all of the stuff of life. We’re seeing that there is no ‘away’ in throwing away and what you toss in the ocean comes back with the next tide. As an artist, I examine all kinds of materials for their properties, resilience, inner stories. In doing so, I have chosen to work with debris. If you listen, trash speaks of our values; each object and substance speaks of its origin. We need to listen, as our landfills (which have exceeded their capacities thousands of times over) have become virtual cities unto themselves. Piloting large experimental projects are my own attempts to turn the wheel the other way. Instead of making more waste, we REUSE waste. Instead of employing highly skilled experts, we TRAIN the unskilled. The aim is not to make more stuff quickly and cheaply, but to address problems through CREATIVE experimentation. Where there is garbage, there is always poverty. A large part of the world – primarily in developing countries – continue to live in extreme poverty within huge global economies of waste. I design products from waste and the production methods that include the poor. In waste reduction and social business, the more challenging aspect is to instill a sense of possibility and creative experimentation in this mix of artistry. My interest is in creating simple solutions for complex problems. I left the studio 8 years ago in Jakarta and founded XSProject (www.xsprojectgroup.com), a sustainable design project which re-uses consumer waste to provide gainful employment. 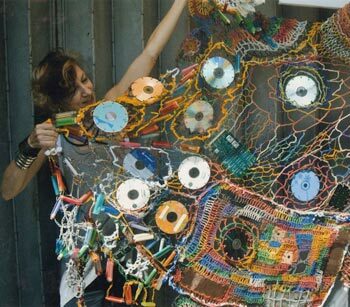 INVISIBLE, based in Manila, follows on from that, encouraging the re-use of waste through crafts skills such as crocheting. Visit us at www.invisiblesisters.org.